The last weekend before Christmas – and I woke up this morning feeling not so great. I already had one cold this month, which turned into an ear infection. I’m hoping it’s just the result of walking around in the cold windy snow yesterday. I’ll be popping vitamin C for the next few days before the big day. On the plus side – I got all of my Christmas wrapping done yesterday – including some last minute gift pick ups. All that’s left is to get ready for our Annual Christmas Cousins get-together tomorrow. Every year Adam’s cousins try to get together for Christmas and this year we’re having it at our new Club House – which is perfect since it’s easier to have a large group of people there than in our townhouse – although we have done it before. Plus, there’s a pool table in the Club House. However, someone has taken all of the pool cues – or – they have put them inside a locked closet. Hopefully we have some for tomorrow’s get together. I’ll be bringing most of my baking – It is currently taking up real estate in our freezer and we have no room for even the ice tray anymore. 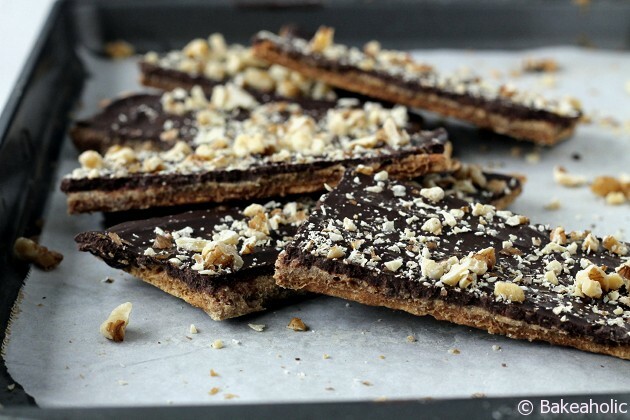 I have made this ‘toffee’ style cracker dessert before, only with saltine crackers. I’ve seen both versions, and I actually prefer it with the Graham Crackers. 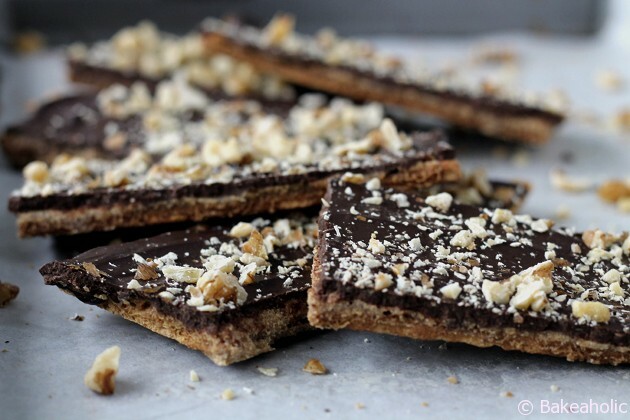 It’s a better, thicker base than the saltine’s, and I think the Salt overpowers the chocolate – the base needs to be fairly bland for such a sweet and decadent topping such as toffee and chocolate. Here I used bought Graham Crackers, however if you have the time (and I suggest you do) you can totally make your own. I have a recipe for Graham Crackers here, and they are very simple and taste amazing when you make them yourself. 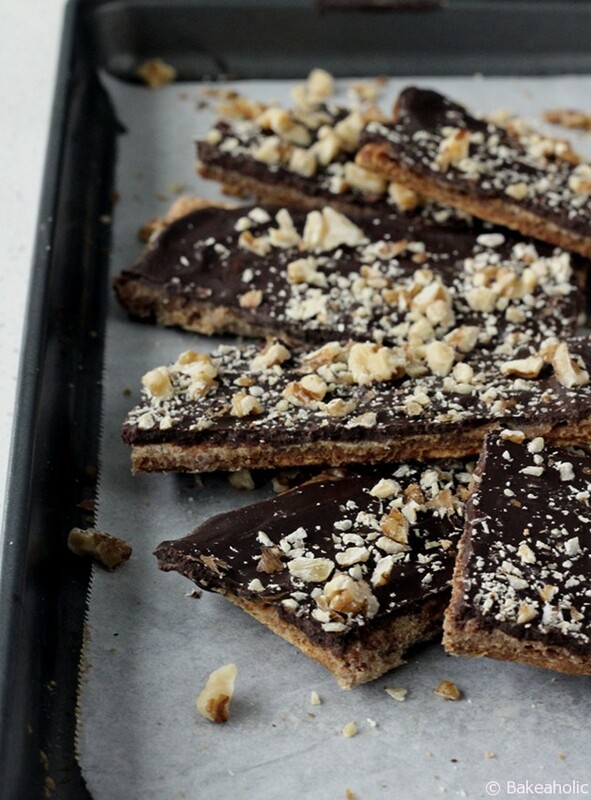 The recipe is affectionately called ‘Christmas crack’ – and the title is deserving. It is mildly addicting – but like I said, with the more neutral graham crust it isn’t tooth-sickeningly sweet. It’s just the right amount. The Toffee portion also isn’t the hard-as-rock toffee, more of a caramel-smooth toffee. 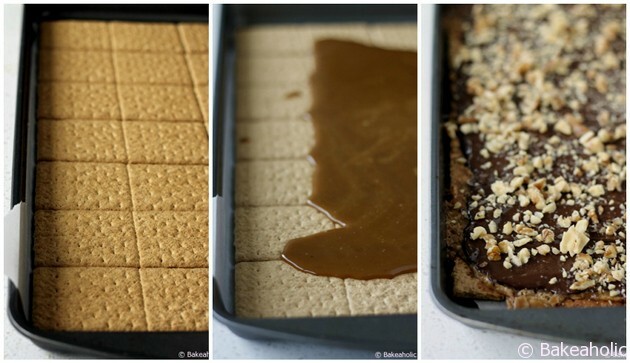 It’s a super simple recipe – lay tray with graham crackers, boil the sugar and butter, bake then spread with chocolate. You can sprinkle anything on top – I like the combination of nuts (walnuts or pecans would be good) You can even package the crackers up for a sweet gift. 1. Preheat oven to 350 degrees F and line baking tray with parchment paper. 2. Arrange whole graham crackers to fit the bottom of the pan in a single layer. 3. Melt butter in saucepan over medium heat. Stir in brown sugar and bring to a boil. Reduce heat to low and allow mixture to simmer for 2-3 minutes. 4. Remove saucepan from heat and pour mixture evenly over the graham cracker layer. Spread with a spoon to cover. Bake in preheated oven for about 5-10 minutes. 5. Remove pan from oven and allow bubbling to subside. Place chocolate chunks on top of toffee layer. Wait two minutes for chocolate to melt, then use an offset spatula to gently spread chocolate in an even layer on top of the graham crackers. 6. 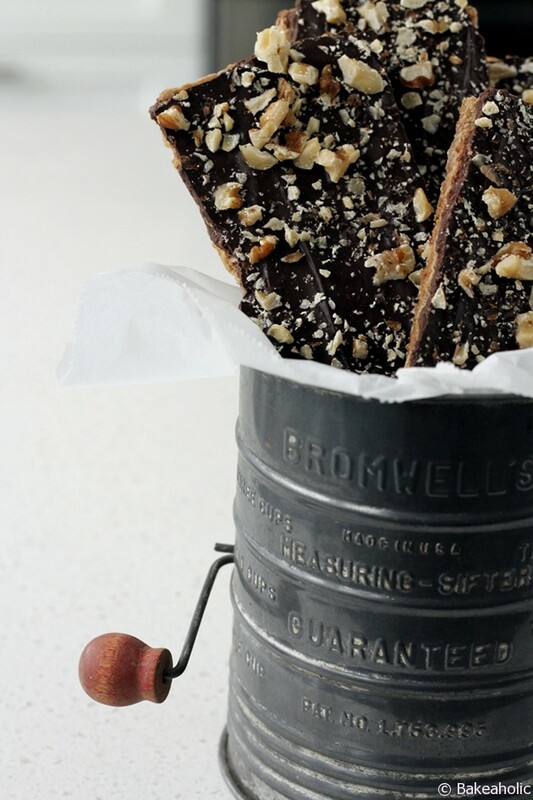 Sprinkle chocolate with chopped walnuts. 7. Allow to cool to room temperature. Break into chunks.